Home » Media » Press » Second Big Shell Counting day at Belgian coast! Second Big Shell Counting day at Belgian coast! Oostende (2018.02.07) – On Saturday 16 March 2019 the Belgian coast will once again be dominated by shells. In ten coastal municipalities shell experts wille be ready to assist all participants of the second Big Shell Counting Day. The aim is to collect and identify 100.000 shells and to improve the knowledge on marine life. Free registration is possible on: www.groteschelpenteldag.be (only in Dutch). 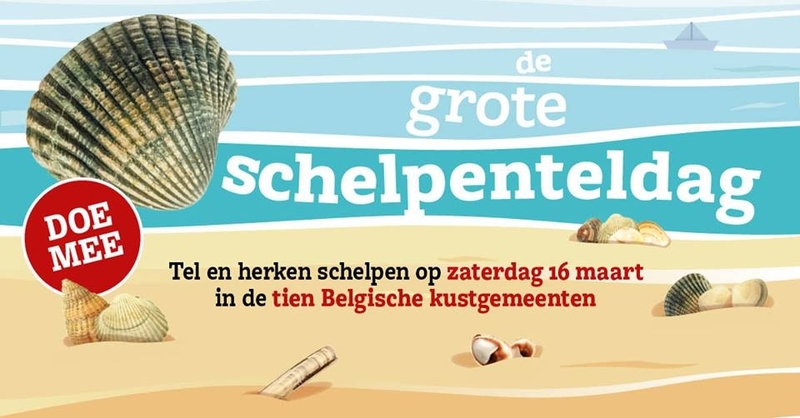 Last year a Big Shell Counting Day took place for the first time in Belgium (17 March 2018). Then 400 citizens gathered, counted and identified 30.000 shells on the ten beach stations, accounting for more than 50 different species. This year, on Saturday 16 March 2019, the organizers – VLIZ, Natuurpunt, EOS, Kusterfgoed, the Province of West Flanders and the Strandwerkgroep – want to do even better. The hope is to engage some thousands of participants and reach the cape of 100.000 shells identified. Scoring and recognizing empty shells is not only fun and interesting. This citizen science initiative also helps researchers with increasing scientific knowledge on the occurrence of this imaginative group of marine animals. After counting, the collected shells are brought back to the beach. The press is also invited to a training moment which will take place on Wednesday evening, 13 February in the buildings of the Flanders Marine Institute (from 7 pm). The training is aimed for the shell experts who will assist the public on 16 March to further perfect themselves in recognizing bivalves and sea snails. Visuals (shells and atmmosphere former edition) are available on demand.